There is an old Japanese proverb, “Vision without action is a daydream. Action without vision is a nightmare”. Let us join you to explore your vision and the ‘roadblocks’ to your vision. Creating the vision is the heart of the session and depending on your needs we can add some or all of the following activities to strengthen the vision and clarify what actions the team will take in moving towards it. The Story So Far – a valuable activity for new or re-organised teams where trust levels may not be high – this activity can last for up to an hour and asks team members to describe their professional journeys so far, the high and low points, the key changes. The end graphic poster typically captures the complexity of the past and the ever-changing territory the team works within. For some teams this process is key to allowing them to take the step into the future that building a shared vision requires. Naming the Nightmare – no more than 5 to 10 minutes is needed for this activity. Here we ask people to name their ‘nightmares’ – the things they would hate to see happening in their organisation or community. We don’t dwell on this nor do we encourage the same level of detailed description that we expect in the vision. However we have learned that some teams/individuals need the extra energy that is released by naming and working to avoid the nightmare. “That was so powerful and motivational”. The facilitation of a shared vision can be delivered as a full or a half day but, unlike our other training days this day depends on your and your team’s needs and the time you have available. We will always begin the session with a range of activities and reflections designed to set the tone for the work to be done. And we will typically follow this up with a session lasting at least an hour where we ask all present to reflect on what matters most to them about their work, what they would love to see happening if there were no constraints on time, people, resources etc. We then ask individuals in twos and threes to share their thinking first with each other then with the whole group. We encourage participants to use their imaginations to the fullest and to stretch their thinking as far as they can as they describe what they would love to see happening in the future – even if they have no idea of how they could get there. This part of the process is not about being realistic – it is about establishing the direction of travel. We facilitate the group to become more grounded as the session progresses. 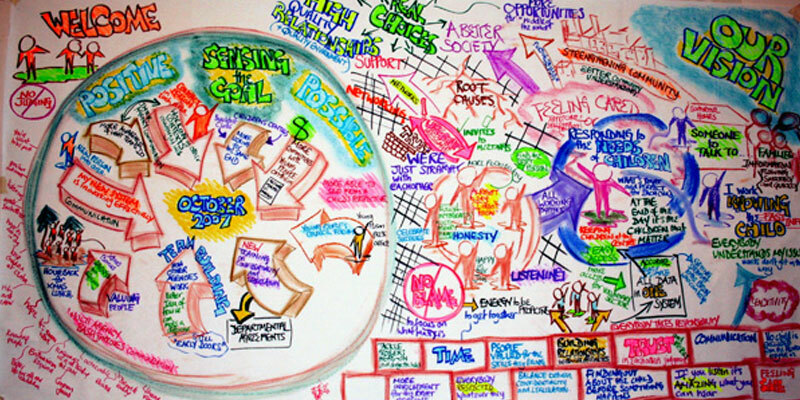 As people give voice to their thinking the essence of what they say is captured on a large and colourful graphic mounted at the front of the room – similar to the image at the start of this section.